10 to 11 is the story of a passionate collector Mithat and the concierge of the building, Ali. For Mithat Istanbul is as vast as his collections and for Ali is nothing more than a few blocks around the building. 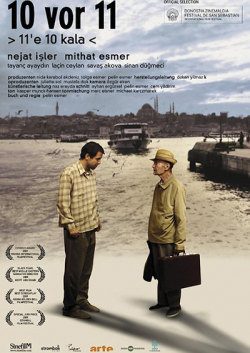 When the neighbors decide to have the building rebuilt with the fear of earthquake and the wish for a more valuable house, Mithat’s most challenging struggle to save his collections begins. The building becomes the common destiny of these two men living alone. Their relationship that begins with the collaboration to save the continuity of the collections changes track with Mithat’s handing Istanbul over to Ali and ends when they involuntarily change each other’s fate.